I’m not a morning person but the summer heat turned me into a morning person this year. Several friends who are early-risers have joined me on these outings to explore outdoor trails nearby, so even though the worst of the summer heat is behind us, I’m still getting up early to get out and explore. This morning’s walk was to Sweet Pond Conservation area in Mansfield, MA, adjacent to ball fields that town residents use for athletic events. I have a soft spot for places with water, and the map promised that there was a pond next to this small parcel of open space. 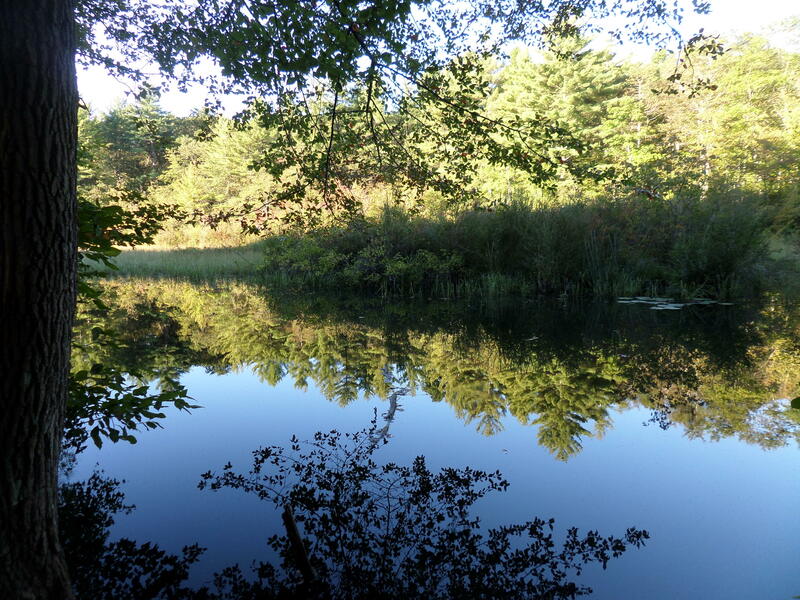 It was hard to see water as we drove into the parking area, but once we got into the woods there was a pretty spot that offered an early morning mirror in the water, in those moments when the air is quiet and the day feels fresh. A small area, but surely a great spot to break things up when siblings have watched one too many soccer games. “Like” us on Facebook at “Easy Walks in Massachusetts” for updates about new trails and all things outdoors.